Have you ever heard someone talk about a moment in his life that something happened and he knew he'd always remember it, no matter what? Maybe you've experienced a moment like that. I used to hear my mom talk about how she remembered exactly where she was when President Kennedy was shot. I can remember exactly where I was on 9/11. But that's not really what this post is about. I always spent a lot of time with my grandparents when I was young. Some of them lived close by and others lived in different towns and cities. The ones who lived closest were the ones I saw the most frequently. My great-grandparents were very instrumental in my life and I spent many days at their house, eating my grandma's homemade vegetable soup or listening to my grandpa tell tales. During one particular visit, my grandpa said something to me that I knew I'd always remember. We were sitting on the couch, which was odd because he most often sat in his recliner. I really can't recall what we were talking about that prompted him to say this, but when he did, it hit me really hard. 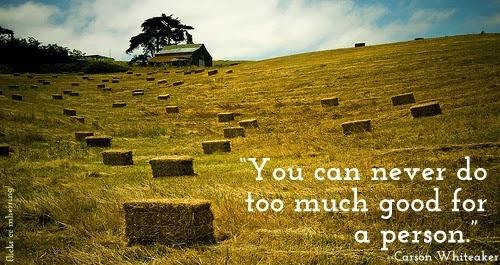 "You can never do too much good for a person." For years, I thought about this...although I didn't believe it. You see, I grew up thinking that in many cases tough love brought better results. That if you kept doing good for a person over and over while getting nothing in return, you'd just end up hurt and bitter. But what my grandpa knew was that there is no end to the good that we can do for each other. Just like there's no end to the good that God wants to do for us. My grandpa wasn't perfect, but he was oh so good. He spent his whole life doing what he thought was best, for the good of others. Even when it meant the ones closest to him got a little hurt in the process. Today is his 100th birthday. And he's celebrating it in Heaven. When faced with the concept of eternity, 100 years is but a moment, a twitch of an eye. My grandpa has only begun to bask in the goodness that is God. It will take him an eternity to let God pour His goodness out on him. But he's got plenty of time.